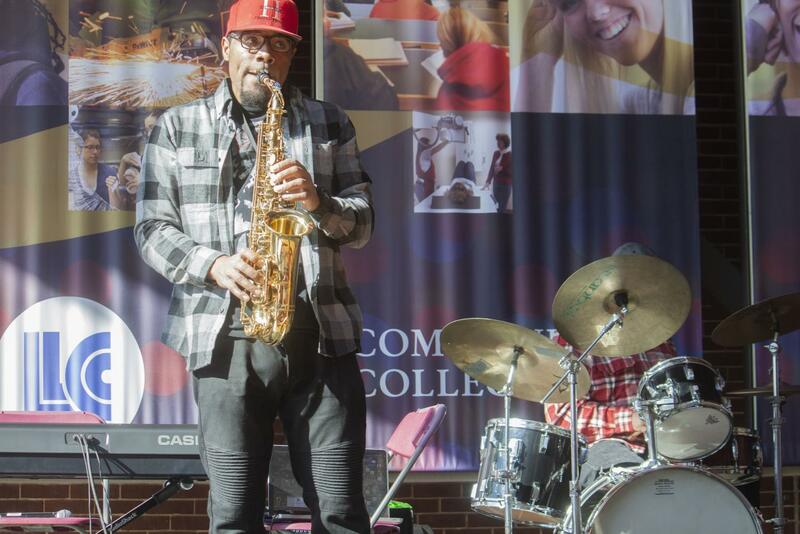 Kenneth Humble plays saxophone on Feb. 1, 2019, in the A.Lincoln Commons. The Kenneth Humble Group was performing as part of the 'Let the Journey Continue' kickoff event for Black History Month. I wish I could take the pain away. If you can make it through the night, there’s a brighter day. Everything will be alright if you hold on. It’s a struggle every day, gotta roll on . . . Excerpted from the song, “Dear Mama” by Tupac Shakur. Growing up in segregated Jacksonville, Florida, during the 1990s—at the peak of the crack epidemic, Olabode Rod Borisade found it tough to not be a victim or become a statistic. “Crime is all over. I beat the odds because I wasn’t selling drugs or robbing people, or getting involved in my negative surroundings,” Borisade said. The lessons he learned as a child helped Borisade battle challenges later in life. He calls himself, Odd?Rod, because he’s overcome the odds, said Borisade, a spoken-word and visual artist, who is returning to Lincoln Land Community College on Feb. 20 for African-American History Month. His show, The Conversation, is about overcoming adversity, Borisade said. “I wrote my way out of suicide and depression and people became part of the show, Borisade said. An interactive multimedia performance focused on his main poem, “Stay,” creates a backdrop for others to tell their stories. Borisade opens up to his real-life issues growing up with a mom struggling with addiction, a distant relationship with his Nigerian-born father and loss of his brother, Eric, who died at 16 from brain cancer. These hardships put Borisade in a deep depression leading to suicidal thoughts. “(Tupac) was the only artist I’ve seen to come out and say it,” Borisade said. The song was “Dear Mama” and Tupac gives homage to his mother, who despite her addiction to crack cocaine, was still a “black queen”. Borisade and his sister, Erica (Eric’s twin), were sent to live with raised by his grandparents and continued writing while in high school. He later earned a full scholarship to the University of North Florida with a degree in graphic and multimedia design. He graduated in 2011. While in college, Borisade produced and hosted a campus open mic night. He said only a few people showed up for his first shows and by the time he graduated over 200 people showed up regularly. Borisade have performed in over 500 cities and colleges, was featured in a TedX and runs a non-profit dedicated to the memory of his brother— Eric’s Life, Inc. and raised over $12,000 for various charities, to “bring people together to keep our angels alive,” Borisade said.